Walking along Queen Street last night I noticed something different. Looking up at the CHUMCity building I noticed that the CHUM sign from the front is now gone. I also saw that the Citytv signs from above the windows of the building have been removed as well. This is obviously not strange. CTVglobemedia now owns the building and thus it's pretty obvious why they removed the CHUM sign. Also, since Citytv is leaving at some point, it makes sense that the Citytv signs come down. But the signs coming down made me think of something. Looking toward the east wall, overlooking the parking lot, I saw another Citytv sign. Surely that one will be coming down as well. I think it's the largest one. Though below the sign is mounted one of the most unique exterior features of the building. Appearing to crash through the wall, its tires still spinning, is a vintage CityPulse truck. While it's not necessarily a landmark in everyone's eyes the CHUMCity building is special. There are very few buildings like it in this city. The changes to the building got me thinking. Sam the Record Man was designated a heritage structure. Those spinning records will be there forever. But what will become of the car bursting through the wall? 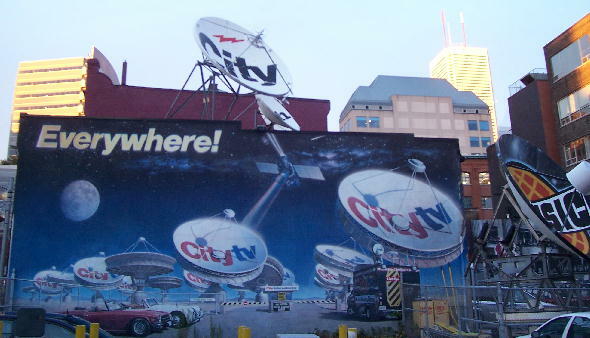 How long before the Citytv mural beside the mass of satellites is replaced with a giant image of Ben Mulroney or Lloyd Robertson? I'm not saying the building should be saved. I'm not saying the Citytv signs should remain. But it did get me thinking. 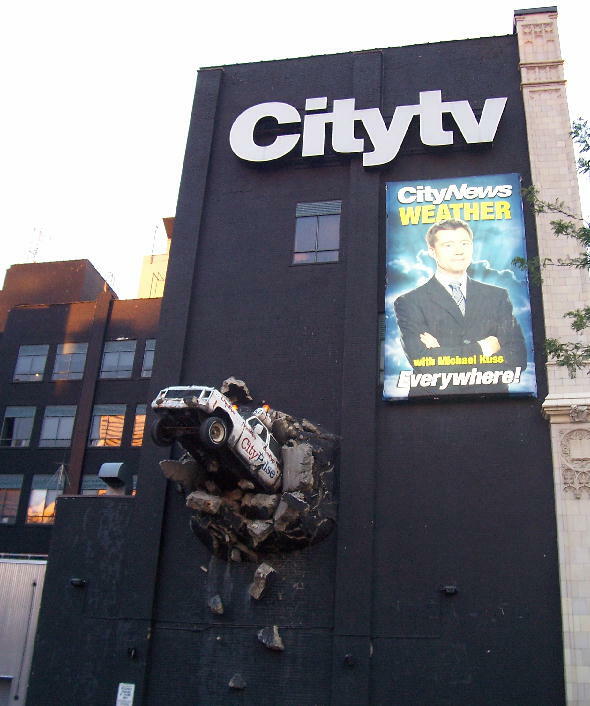 If or when the car comes down, when CTVglobemedia is done rebranding the building, will Toronto have lost another landmark? Or would it simply be one media company moving into a building that was once occupied by another media company? Do people have fond memories of the CHUMCity building, the way they do about Sam's? Is this building, and the signage attached to it, an iconic structure that should be preserved? Or is it just another building?